Admit it- it has happened to you. You’re in a restaurant, enjoying a nice dinner with your lovely companion. 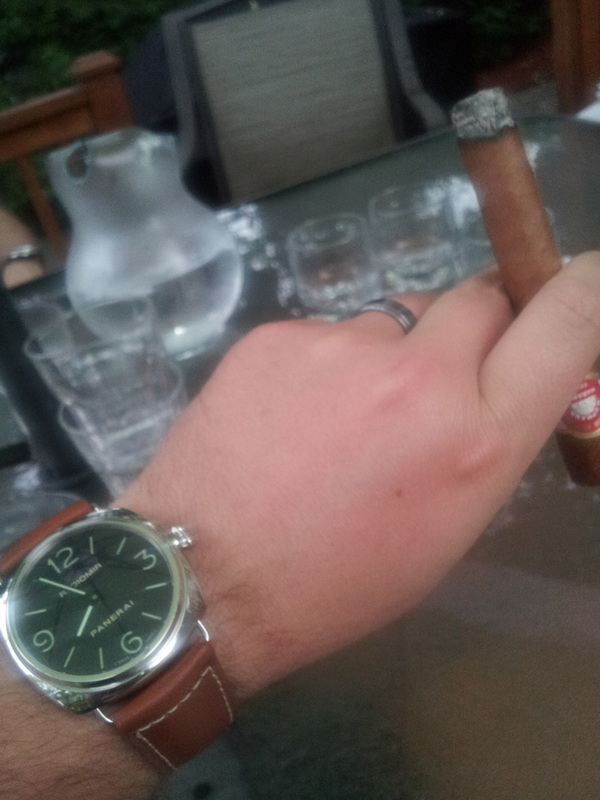 As you sip your wine, you look over to the next table and see a guy wearing a Panerai Luminor. You can’t mistake it for anything else. You think, “Holy $h!t- that’s an awesome timepiece! I want one!” Your companions’ lips are moving, but you don’t hear anything. You can’t smell or taste your food. You just keep glancing at that guy’s Panerai. As soon as you arrive home, you go straight onto the internet and try to look up that guy’s Panerai. Which model was it? How much does it cost? Automatic or manual? What an incredible timepiece…. However, Panerai also polarizes watch lovers. One very famous watch (snob) blogger has been very vocal in his criticism of Panerai over the past years. He referred to Panerai watches as “overpriced pocket watches on steroids.” Or something like that. He, like many watch aficionados, does not care for oversize pieces and it was Panerai that started the whole oversize trend to begin with. As well, real watch snob aficionados point out that MOST Panerai use ETA-based movements such as the Unitas-based movement. Watch snobs claim that Panerai is not a true “manufacture” of high end movements. You see, Panerai did not develop their own in-house movement until 2005. If you read the history of Panerai, you will see that the very first Panerai diving watches for the Italian navy in the 1930’s actually used…Rolex movement. Panerai were associated with Rolex for a long time. When the brand was “reborn” in the late 1990’s following its appearance in the film, Daylight, its watches used supplied movements such as ETA. This, of course, is common practice. Even IWC use some ETA-based movements. In 2005, Panerai introduced their very first in-house movement- the P.2002 movement- a hand-wound caliber with GMT function and 8-day power reserve. In 2007, Panerai introduced three more in-house movements including a tourbillon. The tourbillon, for those who are new to watches, is the most prized and esteemed complication in watchmaking. Panerai has continued to introduce new in-house movements each year since. 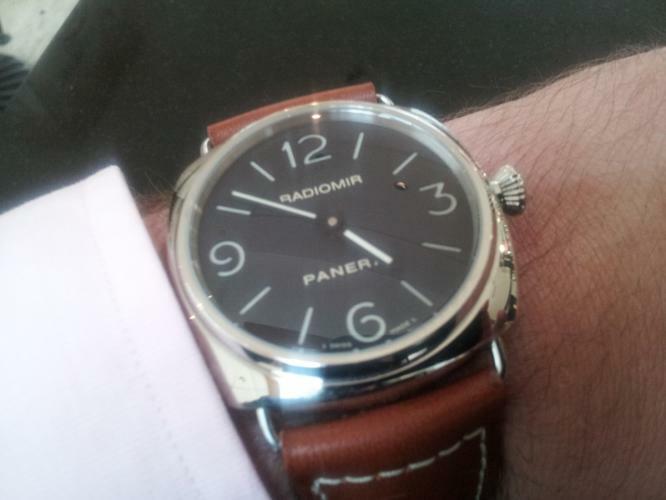 Therefore, Panerai-haters are correct to point out that the branch does not have a century of movement-making heritage. But you have to give them credit for trying in recent years. My favorite Panerai have always been the base models with the good ol’ fashioned Unitas-based movement. I recently acquired one- the Radiomir PAM00210. I should probably blog about that particular purchase later. I also wore a Luminor PAM00111 for about 1 week. So I have some experience wearing hand-wound Panerai with the Unitas movement and I obviously see nothing wrong in spending some bucks on a timepiece without an in-house movement. For me, the attraction to Panerai has always been…..simplicity. Very simple, clean, bold designs in very large cases. Very basic, manual-wind movements. My PAM00210 does not even have a second hand. Just hours and minutes. If you have ever read about the famous Unitas movement, you will know that it was originally designed as a pocket watch movement. And when you wear a PAM00210 or PAM00111, it feels like you’re winding up a big pocket watch and strapping it to your wrist. Very cool. It feels industrial and utilitarian. After all, Panerai have a military history. Ah- the Panerai history. Google it. Read some blogs. I never purchase a timepiece without knowing about the brand’s history and its story. I need to know about the brand’s accomplishments and its values. After all, when you buy a watch, you are buying the brand. Panerai have a very cool story. My particular Radiomir also has a super cool story behind it. These factors are KEY when buying a timepiece.